This page includes The Club News columns from the 1998 issues of Across the Fence Post. Milwaukee-area clubs held their 12th annual Distinguished Philatelist Appreciation Dinner on March 15, 1998. This year's honoree was Ralph West. He was selected for the honor because of his repeated demonstration of interest in the hobby of stamp collecting. The 1998 event was hosted by the Milwaukee Philatelic Society, with Dona Fagan serving as chairman of the Advisory Committee. The Outagamie Philatelic Society (Appleton) is disposing of their 81 12-page wood and Plexiglas exhibit frames. The frames were formerly owned by the Milwaukee Philatelic Society and are free to anyone who is willing to pick them up immediately following WISCOPEX '98. Deadline for pickup is Tuesday, April 28. For further information, contact Verna Shackleton at (920) 734-2417. The Badger Stamp Club will staff a table at Madison's Capitol Square on May 30. In addition to promoting the club to adults, youths will be introduced to the hobby by receiving a tree packet of stamps. BSC also will sell a first-day cover commemorating Wisconsin's 150th anniversary plus another cover with Madison's second-day-of-issue cancel on the Wisconsin Statehood stamp. See "Cover Listing" for descriptions and mail-order instructions. Best of Show plus 1st in U.S. category and People's Choice - Important Firsts in U.S. 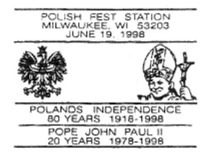 In honor of POLISH FEST 98 (June 19-21), the Polish American Stamp Club has produced a set of three multicolored postcards featuring the Polish eagle and tile Pope. The postcards are canceled with a special POLISH FEST pictorial postmark. TO order the set of three, send $2 50 and a SASE to: Polish American Stamp Club, Box 1920, Milwaukee, WI 53201. Make checks payable to the Polish American Stamp Club. On May 30, members of tile Chippewa Valley Stamp Club joined (lie U.S. Postal Service at Eau Claire's Chippewa Valley Museum for a Wisconsin Statehood stamp event with a special cancel. The cancel is available a WFSC all-purpose covers via mail order for $1 each and a SASE. Send orders to: Mike Zlotnick, Pres., Chippewa Valley Stamp Club, 227 Country Club Ln., AItoona, WI 54920. The annual show will be held September 26-27 at the VFW Hall, 388 River Dr., Wausau. Features include exhibits, a U.S. Postal Service substation, youth table, and bourse. To reserve a table at the bourse, contact Jim Johnson at (715) 359-4326. MILCOPEX '98, sponsored by the Milwaukee Philatelic Society, is scheduled for September 18-20 at the Wisconsin State Fair Park in Milwaukee/West Allis. Visitors might want to keep in mind that although the show's general location is the same as usual, this Year's ear's event will be held in the Youth Center rather than in the Trade Mart Building. MILCOPEX '98 is host to the American Helvetia Philatelic Society's annual meeting; Plans are for a 35-dealer bourse. The exhibit prospectus and entry form is currently available. To request a copy, write to: G.C. Yost, P.O. Box 1013. Milwaukee. WI 53201-1013. November 1999 marks the Milwaukee Philatelic Society's 100 anniversary! Circus Parade clown and film star Ernest Borgnine is featured on the multicolored cachet of MPS's 1998 parade cover. Covers were canceled each day of the parade celebration held July 29-August 2 at the lakefront Veterans Park showgrounds. MPS has issued circus parade covers for each year 1971-73 and 1985-98. Cost of the 1998 cover is $1.50 each or $5 for a set of four. Send orders to: MPS Circus Covers, P.O. Box 1980, Milwaukee, WI 53201. Make checks payable to MPS and include a No. 10 SASE. Effective July 21, the Collectors Corner. Philatelic Center at the Oshkosh Post Office. 1025 W. 20th Ave., will be open Tuesdays and Wednesdays from 9:30 a.m. to 12:30 p.m. and 1:30 p.m. to 4:30 p.m. The monthly, fall/winter WVPS stamp and coin fairs have moved to the Cedar Creek Mall, 10101 Market Rd., Mosinee. To get there, take exit 185 off of Highway 51 South. Dates for the 1998 fairs are November 14 and December 12. 1999 dates are January 9, February 6, and March 13. The April date has not yet been determined. Fair hours are 10 a.m. to 4 p.m.
Fair chairman is Jim Johnson, who can be reached at (715) 359-4326. This year's WauSAUpex ‘98 had 10 displays judged by "People's Choice" ballots. Tied for first in the Adult Division were: Wausau and Marathon County Postal History by Bill Grosnick; and Marathon County Post Offices, by Jim Rhyner.